discouraged.13 All firelocks must be fitted with a flash guard and period correct hammer cap. Blunderbusses, rifles and 1804/1816 Springfield muskets are prohibited. Please check with a member of the field staff prior to purchasing a musket to ensure it is correct for our portrayal. Bayonet Carriages: May be over the shoulder or waist belt style. They should be constructed of leather or linen/hemp webbing and leather and must conform to period examples.15 Modern rope shall not be used for slings or belting. Round forged belt buckles are BANNED. Shot Bags: Shot bags may be used as a substitute for a cartridge pouch. They must be made of leather and conform to period examples.17 In addition, they must be able to accept a wooden cartridge block. French throwing axes, “peace pipe” axes or any other type of axe with a long thin blade are inappropriate. Glasses: While glasses certainly existed in the period, they were uncommon among the lower classes of society due to their value. It is preferred that no one wear glasses, but if you must, invest in period appropriate frames. Tent: If you purchase a tent, you should acquire a 1751 French Bell Back Tent. Camp Furniture: Should NOT be acquired without consulting an officer or NCO of the LTB. 13 Erik Goldstein and Stuart Mowbray, The Brown Bess: An Identification Guide and Illustrated Study of Britain‟s Most Famous Musket, (Woonsocket: Mowbray Publishing, 2010): 18-91. Also see Ryan R. Gale, “A Soldier-Like Way:” The Material Culture of the British Infantry, 1751 – 1768, (Elk River: Track of the Wolf Inc., 2007): 5-20; Steve Delisle, The Equipment of New France Militia 1740-1760, (Maryland: Kebeca Liber Ata Co., 1998): 32-35; and Jim Mullins, Of Sorts for Provincials, American Weapons of the French & Indian War, (Elk River: Track of the Wolf Inc., 2008): 11-16. Rev War Campaigners, 2008 and Goldstein and Mowbray, 16. 15 Neumann, 30. See also Don Troiani and James L. Kochan, Don Troiani’s Soldiers of the American Revolution, (Mechanicsburg: Stackpole Books, 2007): 111, 132. 16 George C. Neumann and Frank J. Kravic, Collector’s Illustrated Encyclopedia of the American Revolution, (Texarkana: Rebel Publishing Co., Inc., 1989), 66-80. Also see Troiani and Kochan, 102, 132. 18 Neumann and Kravic, 149-155 and Mullins, 45-47. 20 Neumann, Swords & Blades of the American Revolution, 84-89, 94, 99-103, 182-186. 21 Neumann and Kravic, 38-39. See also Troiani and Kochan, 142. 22 Neumann and Kravic, 59-64. 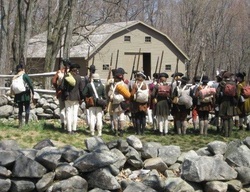 Soldiers in 1775,” Historical Costume Services, 1998. 8, No. 2 (Summer 1995): 27-29. 28 Neumann and Kravic, 108-109, 173-175.